Ljubljana's Triple Bridge at night. Ljubljana, the capital of Slovenia, has all the makings of a picturesque European town. There’s a castle on the hill, a river winding through the city crossed by arched bridges, and colorful art nouveau buildings surrounding open squares. While Ljubljana is a capital city, the Old Town feels very small and can be explored in a day. One of the first things we did upon arriving in Ljubljana was to view the town from the water while taking a boat cruise along the Ljubljanica River. Not only does the boat cruise provide a beautiful view of the Old Town, it also delivers a peek at Ljubljana life when you catch locals fishing in the water or relaxing on the grassy shore. It is a slow, relaxing way to get your bearings in the small old town. Boat cruises run hourly and depart near the Triple Bridge. Ljubljana does not have a lot of museums, but rather is more about taking in the sights of bridges, churches, and unusual statues. A walking tour of Ljubljana can start by first passing by the National and University Library, the masterpiece of Jože Plečnik, Ljubljana’s architect. The library is a red brick building with large grey blocks protruding outwards. The oddly shaped blocks are supposed to represent a complex numerological pattern as well as symbolize deeper messages of attaining enlightenment by overcoming obstacles. Can you decipher the numerological pattern? 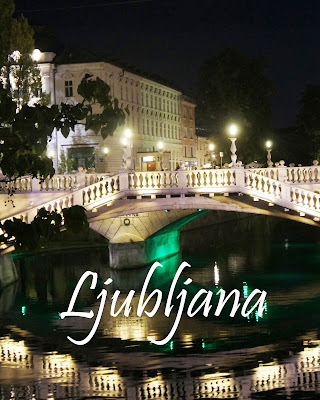 The walking tour continues along the Ljubljanica River with a view of Ljubljana’s bridges, including Cobblers’ Bridge, Triple Bridge, and Dragon Bridge. Dragon Bridge is guarded by a green dragon that looks like its skin is melting. The dragon is one of many unusual statues that can be found around the Old Town. The dragon guarding Dragon Bridge. After crossing Dragon Bridge, you can visit the Cathedral of St. Nicholas, which was built in the 18th century. The cathedral has an expansive Italian Baroque interior with high frescoed ceilings. One of its unusual features is outside, an intricately decorated door created for Pope John Paul II’s 1996 visit. Ljubljana’s major attraction is Ljubljana Castle overlooking Ljubljana high on the hill. The castle is reached by a funicular railway, and the tower provides the best views of the town. The castle features a Gothic chapel with paintings of coats of arms along the walls. If you coordinate your time at the base of the Ljuljana Castle funicular railway with the top of the hour, you’ll get a chance to see Martin Krpan, one of Slovenia’s famous fictional characters, step out of the Ljubljana Puppet Theatre’s roof turret clock with his faithful mare. Martin Krpan and his mare stepping out of the Ljubljana Puppet Theatre's clock. Be sure to stroll through Ljubljana’s Old Town at night. During the summer locals and travelers alike are eating and drinking at outdoor restaurants and cafes. Preseren Square, with the Franciscan Church and Centromerkur, and triple Bridge are illuminated. Ljubljana's Preseren Square at night. For Ljubljana dining, our restaurant of choice was Pri Skofu. Pri Skofu is off the main river drag and doesn’t have the views the riverside restaurants provide, but it served some of the best meals of our trip. Our favorite dish was the steak wrapped in prosciutto with wine sauce. The food was inventive and beautifully presented, and they also served some great local wines. Along with describing all of Ljubljana’s positive attributes, I must admit I found Ljubljana a bit disappointing too. I found it unfortunate that such a pretty town is defaced by graffiti, which made it feel like some of the local residents don’t appreciate their historic town. Since there is not much to do and see in Ljubljana, the only reason to stay in the city for multiple nights is to take advantage of the cosmopolitan restaurants. However, in hindsight, I think we would have been better served staying in a place like Lake Bled, which is not only beautiful but was also closer to many of our day trip destinations, and just made a day trip to Ljubljana. A small example of the prevalent graffiti in Ljubljana's Old Town. If you do choose to base yourself in Ljubljana while exploring Slovenia, be sure to make hotel reservations early if you are looking for an affordable stay. We ended up staying in a hotel we weren’t crazy about because all of the cute, small, and affordable accommodations were already fully booked. We visited Slovenia in September, and I booked our hotel at the end of June. Ljubljana is a very picturesque town with not much to do, but it can provide a great base from which to explore other parts of Slovenia if you wish to stay in a city. If you do not choose to stay in Ljubljana, I still suggest planning a day trip to visit Slovenia’s capital, where you can spend a leisurely day exploring Ljubljana by foot and relaxing on a short river cruise. I planned our Slovenia travels, including our time in Ljubljana, using Rick Steves' Croatia & Slovenia. This post contains affiliate links. If you purchase or book through them you pay nothing extra and they help fund our travels so we can bring you more travel stories.